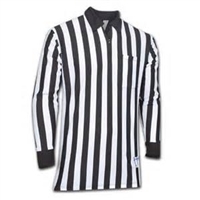 Performance Heavyweight Interlock Fabric Long Sleeve Referee Shirt Smitty's long sleeve football referee shirt with a 2" stripe is constructed of heavyweight breathable interlock fabric that wicks away moisture for added comfort in a wide range of weather conditions. The split-bottom hem remains tucked in with its extra long length. Smitty's 2" Stripe "Elite" Performance interlock referee shirt is constructed of lightweight fabric that is comfortable in all conditions. Smitty's 1" Stripe "Elite" Performance Interlock Referee Shirt is lightweight fabric and comfortable in all conditions. This mid-weight shirt wears well, has a soft feel and keeps you cool. It has extra tuck-in length with a split tail bottom to give you a neat appearance look . This mid-weight shirt wears well, has a soft feel and keeps you cool. It has extra tuck-in length with a split tail bottom to give you a neat appearance look.